The last couple of months, I’ve been lurking around Reddit’s beauty subs, mostly Makeup Addiction and Indie Makeup and More. It turns out there is a whole world of independent makeup and fragrance companies that sell their own creations online at pretty affordable prices! It is really interesting. 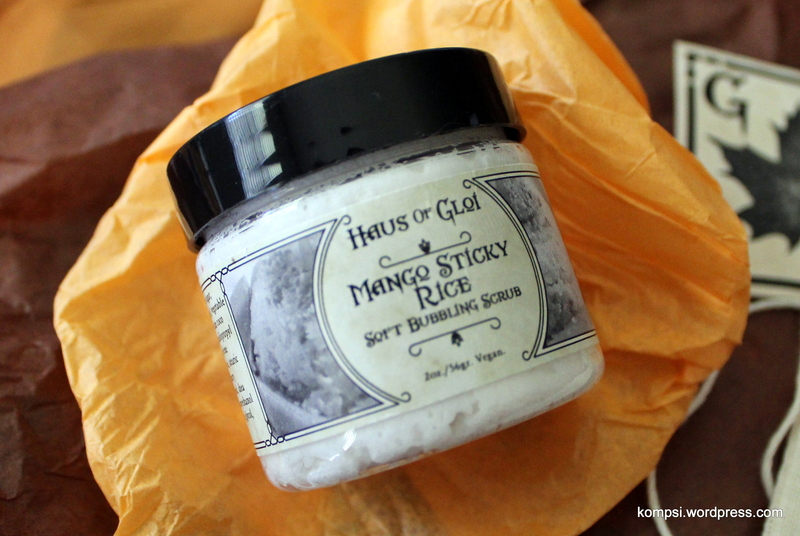 Although I am planning on purchasing some indie makeup (I’ve gotten a start with ColourPop and looking into purchasing from Fyrinnae and Shiro Cosmetics as well), I went ahead and ordered some fragrance and body products from Haus of Gloi, an independent vegan shop based in Gresham, Oregan. My order – it came packed in tissue paper (and newsprint) and included a handwritten note and a piece of Asian candy. Along with perfume oils, the Haus also produces soaps, scrubs, hair oil and body lotions. They have a catalog of year-round scents, as well as limited edition seasonal scents. Although it would seem counter-intuitive to order scented products online without the chance to smell them first, most indie shops including the Haus offer sample sizes so you can essentially “try before you buy” without making quite a financial commitment. For my initial order, I got four perfume oil samples and a bubbling scrub sample, all from the general catalog. 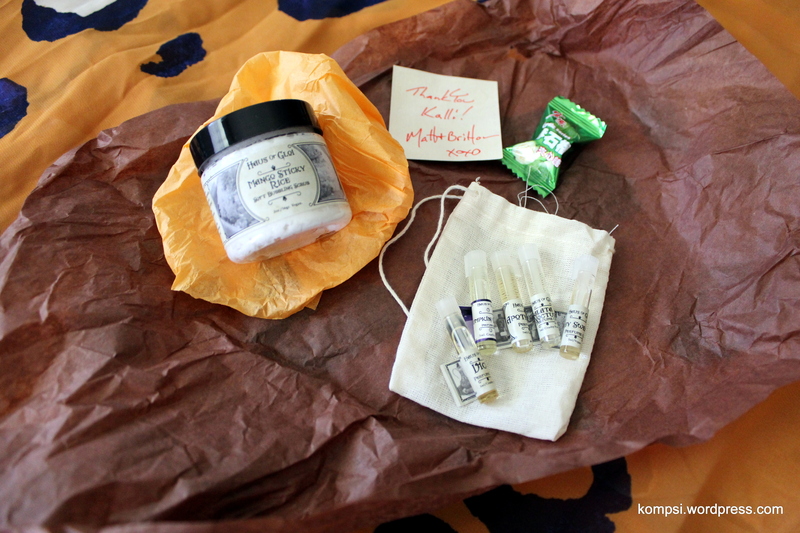 With my order, I also received a free perfume oil sample of an autumn seasonal scent! With shipping, my entire order came out to about $13.00. 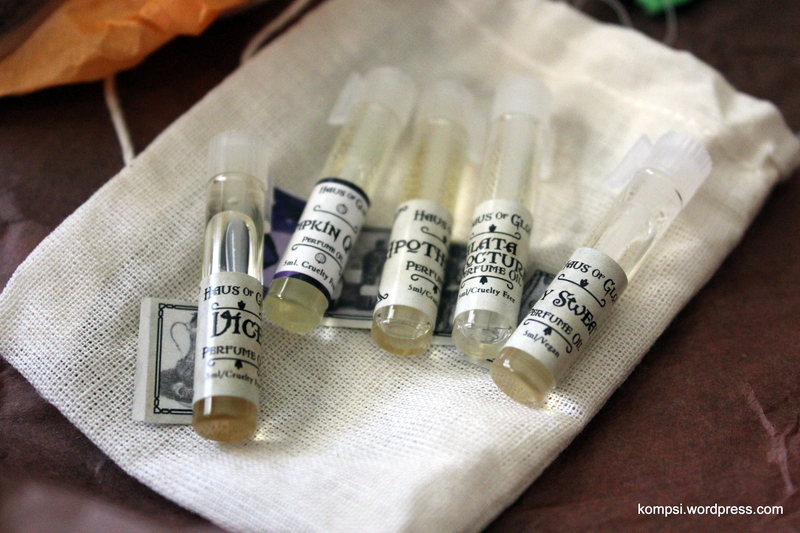 The perfume oils came packaged in a small linen pouch. On first smell in the vial, it comes off as very sharp, medicinal and herbal. On the skin, it mellows out a bit and loses it’s sharpness but it smells exactly what you’d think an apothecary would smell like. It comes off a little bit soapy as well, so I think it would make a good bath product. About three hours after I put it on, it faded quite a bit and smelled more herbal rather than medicinal. Another three hours later and I couldn’t smell it at all, it had totally faded. Pale skin musk, faded perfume, Egyptian amber, softly burning nag champa incense and a fine aged vanilla. It really does remind me of a soft cashmere sweater. The nag champa incense is most prominent in this, it what I can smell first in the bottle and on my skin. It has better sillage, but I don’t think it’s too strong. On the dry down, I can still pick out the incense but it’s mixed well with the other notes and just is a nice perfume-y scent that is indeterminable. The longer it wears, the muskier it smells. Smells like a vintage oriental fragrance. Definitely one for the cooler months (which won’t be happening here for awhile). About eight hours after I initially put it on, it’s faded a lot and smells a bit more powdery. I couldn’t smell the nag champa or musk at all. Italian lemon, rubbed tomato leaf, olive leaf, black fig syrup and basil. In the vial, it smells earthy and herbal, like gardening in wet soil (in a good way). I can really pick out the basil and tomato leaves. On the skin, it smells totally different! The herbal and earthy notes totally disappate into a soft, almost powdery perfume where I can’t really pick out any specific notes. It smells really nice and it was quite surprising. Although the description of this seemed a little too earthy and foodie, it’s actually quite pleasant. Sits very close to the skin, not much sillage. In the vial, all I could smell was chocolate and something sort of caramel-y. On the skin, I could catch the Turkish coffee, graham cracker (I think that was the caramel note I was sensing) and only a little bit of chocolate. On the dry down, it’s just chocolate, I can’t smell anything else. I think I would like this better as a bath product rather than a perfume. In general, I just don’t like the smell of chocolate on my skin. However, on a second wear I could pick out more caramel notes, the chocolate didn’t seem so heavy and I liked it a lot more. Gentle hay pillows, pumpkin, ripe peaches dusted with clove and nutmeg, dried summer herbs, and lastly, a lovely crown of amber. In the vial and initially on the skin, it smells very creamy, warm and cinnamony. It’s quite strong, but not over powering. I was able to smell it on myself all morning. A few hours later, it faded a bit and lost some of the cinnamon. It smelled a littler muskier, but still had a sweetness and creaminess in the background. It’s very much a straightforward fall scent, in a good way and makes me wish that San Antonio had real fall weather! This was such a unique product! And smelled OM NOM NOM DELICIOUS. In the jar was OMG LOVE. It smells warm and toasty, and I can totally pick out the rice, with the sweet mango in the background. Knowing what the notes are (rice and mango, duh) it totally smells like the real thing, but I think it’s blended well enough that it could be a wonderful perfume without people thinking you smell like dessert. As a scrub, it had a really interesting texture. 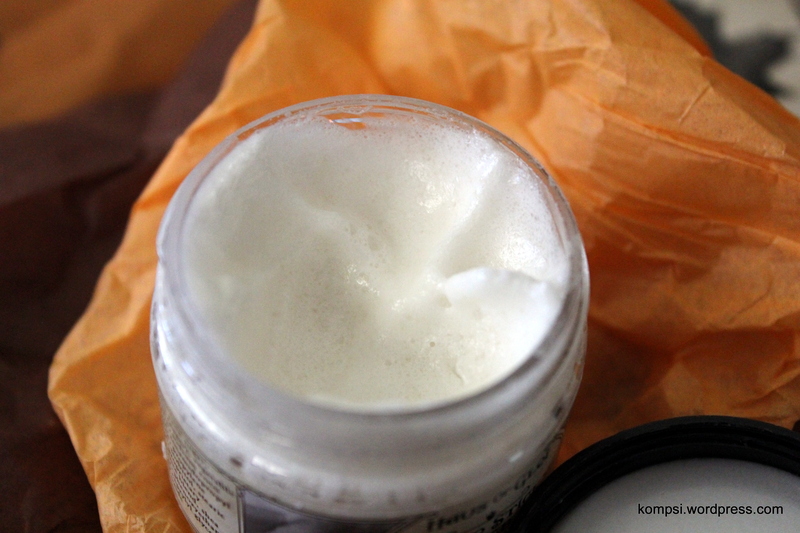 Sort of spongy and thick, it’s foams up nicely and the sugars are really nice exfoliators. I prefer sugar scrubs because the sugar dissolves as you work it in and it won’t leave your tub gritty. My only complaint about this product is that the wonderful scent doesn’t stay on my skin after the shower. I would definitely purchase in every available product! It really smells so good. Close up of the scrub after I used it once. It came to me completely filled to the top. I am so excited to have discovered this company! I’m looking forward to trying more of their scents and products, especially the seasonal scents. They seem to have a pretty big following, even though it’s just a two-person team handling all aspects of the operation. This is definitely a company you can feel good about buying from. The Rocky Horror Picture Show X MAC – Let’s do the Time Warp!